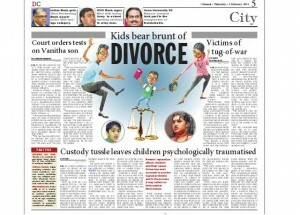 Kids bear brunt of divorce: CRISP voices concerns of the unheard Child! 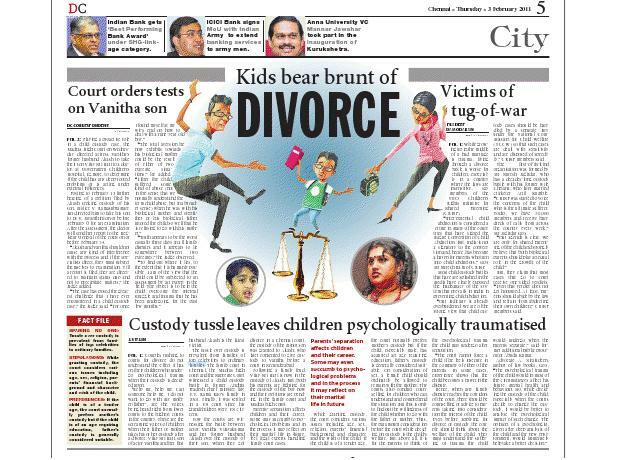 Kids bear brunt of divorce: CRISP voices concerns of the unheard Child in Chennai! Feb. 2: Playing a proactive role in a child custody case, the Madras High Court on Wednesday directed actress Vanitha’s former husband Akash to take their son Vijay Sri Hari to a doctor at Government Children’s Hospital, Egmore, to determine if the child has any deep-rooted problems or is acting under external influences. Posting to February 15 further hearing of a petition filed by Akash seeking custody of his son, Justice V. Ramasubramanian directed him to take his son to Dr V. Jayanthini on or before February 6 for an examination. After the assessment, the doctor will send her report to the Registrar General of the court on or before February 14. “Akash and Vanitha should not cause any kind of interference with the process and if the specialists direct, they must subject themselves to examination. Till a report is filed, they are directed to maintain status quo and not to precipitate matters,” the judge added. “Truth appears to be the worst casualty these days in all family disputes and it appears to lie somewhere between two extremes,” the judge observed. Feb. 1: While growing up in the middle of a bad marriage is trauma, living through a divorce battle is worse for children, especially in a country where the laws are insensitive, say members of the NGO Children’s Rights Initiative for Shared Parenting (CRISP). “Inter-parental child abduction is considered a crime in many of the countries that have signed the Hague Convention of Child Abduction. But, India is not a signatory to the convention and, hence, has become a haven for parents who turn into child abductors,” says Mr Suresh Ram of CRISP. Most child custody battles that have are splashed in the media have clearly exposed the inadequacy of the system that prevails in India in preventing child abduction. “Our judiciary is already overburdened. We are of the strong view that child custody cases should be handled by a separate jury under the National Commission for Child Welfare (NCCW) so that such cases are dealt with sensitivity and are disposed of speedily,” CRISP members said. The first-of-its-kind organisation was formed by Mr Kumar Jahagirdar, who has a decades-long custody battle with his former wife Chetana, who later married cricketer Anil Kumble. “CRISP was started to voice the concerns of the child who is the ultimate sufferer. Today, we have 30,000 members and receive hundreds of calls from across the country every week,” Mr Jahagirdar says. “Our agenda is clear. We are only for shared parenting of the child and strongly believe that both biological parents should play an equal role in the growth of the child.” But, they claim that most cases that go to court receive one-sided verdicts. “Even that verdict does not get honoured. At least, parents should abide by the law and refrain from abducting their own children,” CRISP members said.